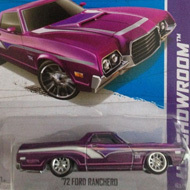 229/250 is part of the HW Showroom series and the 2013 Super Treasure Hunt set. 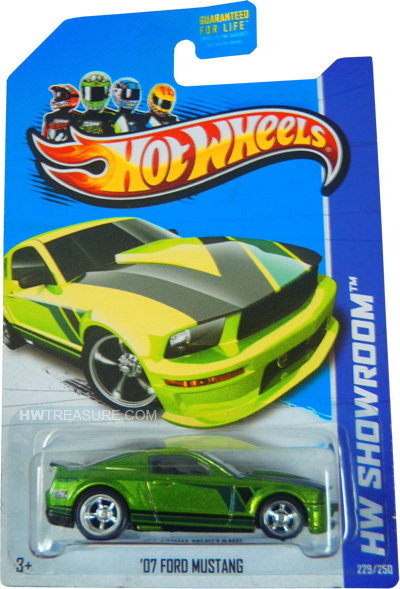 The Spectraflame green Mustang boasts black and dark green graphics on the sides, hood, and spoiler. The sides also have “TH” and the Hot Wheels logo. It has clear windows, a black interior, Real Rider 5-spoke mag-style wheels, and a black Malaysia base. 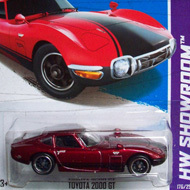 The car first appeared in the Modern Classics series in 2008. It is based upon a customized version of the actual vehicle.